Kawasaki Maryville Website - Welcome! As economic engines go, the Kawasaki plant in Maryville, Missouri, has few rivals. This thought is not lost on anyone observing what has become of a factory that first opened in 1989 with 150 workers producing a single model of its product — an actual small engine. Maryville, MO - The city of Maryville and Kawasaki Motors Manufacturing Corporation USA plant are working together to put in place a $25.5 million equipment project. 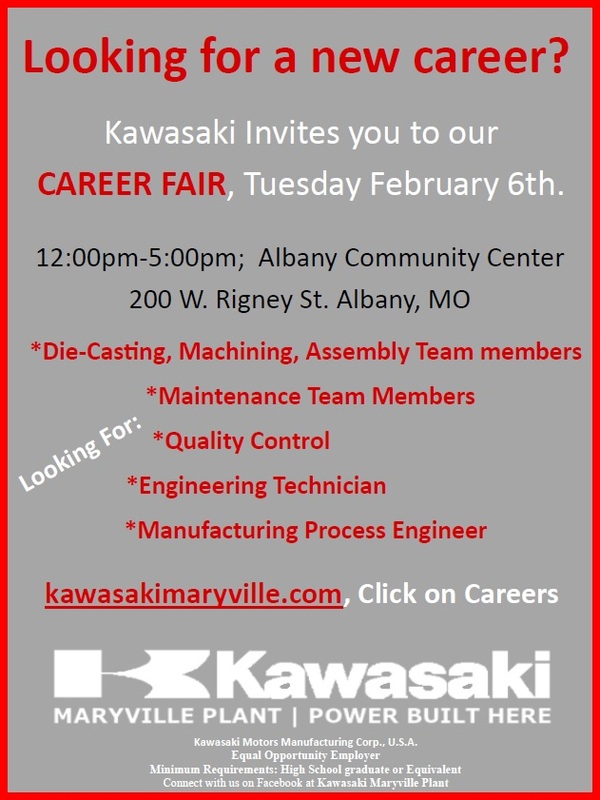 Maryville, MO - Kawasaki is hiring and we are continuing our series of career fairs in Albany, MO. Stop by and discover the opportunity that Kawasaki can be for you! Maryville, MO - The Maryville City Council at its Monday night meeting approved a resolution of intent and accompanying ordinance to launch a second tax-abatement agreement between the city and Kawasaki Motors Manufacturing Corp.
Maryville, MO- In his twice-monthly report to the City Council, McDanel said a performance agreement associated with the $25.5 million expansion required Kawasaki to maintain an average of 30 new jobs above a minimum of 775 employees on the payroll as of Dec. 31, 2017. Maryville, MO - Kawasaki Motors Manufacturing Corporation and its Maryville facility have helped drive the region’s economy for nearly 30 years as the county’s largest employer. Now the company is lending its support to help power dreams and opportunities for Northwest Missouri State University students. Maryville, MO - The survey measures economic development in terms of industrial projects embracing major capital investment, job creation and building purchases.